Now Comes in GLUTEN FREE DAIRY FREE! Natural Vanilla Flavor, Nature's Superfood! 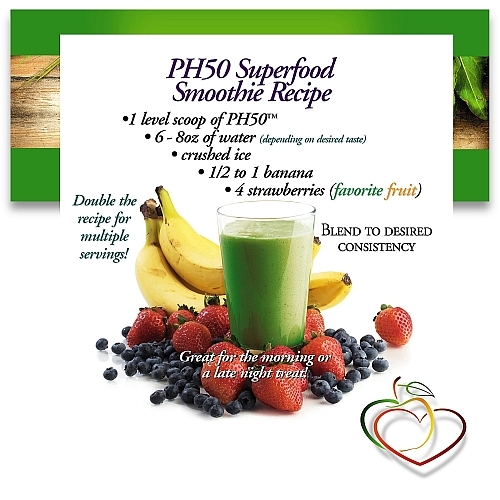 With Pea/Brown rice/Hemp Protein SuperBlend and over 50 superfoods! • MSM • Pure Brown Seaweed and Much More! PLEASE DO NOT BE MISLED BY OTHERS OFFERING A LESS EFFECTIVE OR LOWER QUALITY COMBINATION OF INGREDIENTS! Their is only one PH50 Protein Greens and it comes from Chiropractor's Blend!! The choice with so many poeple? AND WHAT YOU GET IN EACH SERVING! Critical To The Function Of Every Cell In Our Bodies. What Kinds of Proteins are Best? Proteins are critically important molecules in our cells, being involved in virtually all cell functions. Every protein in the body has a specific function including structural support, bodily movement, or in immune response. Proteins vary in structure as well as function. They are constructed from a set of 20 amino acids, so it is important to consume proteins that comprise the complete spectrum amino acid profile. If you’re not a vegan or and you are not lactose-intolerant or suffer from dairy allergies, then dairy-based proteins like whey and casein are excellent choices for their muscle-building benefits as well as their high levels of zinc and iron. But even if you’re not vegan or allergic to dairy there are still good reasons to integrate plant-based proteins into your diet as well. Plant-based proteins are easily digestible and have demonstrated the capacity to fight inflammation and reduce muscle soreness more effectively than dairy-based proteins. This makes plant-based proteins an excellent addition to any athlete’s diet, as well as an overall way to boost your general amino acid profile. There are a wide range of Plant-based proteins that are available, so what are your options and what are the advantages of each? Pea protein contains up to 80% protein, is GMO-free, mixes well with liquid and is smooth. Brown Rice protein has up to 70-90% protein, is GMO-free, mixes well with liquid and is smooth. Soy protein contains 65-90% protein content, but it is at High Risk for GMOs since soy is so widely modified, but it is otherwise very soluble and smooth. Hemp protein has up to 35-50% protein, is GMO-Free with an Earthy flavor that doesn't mix terribly well with liquids and is grainy. Chia protein contains up to 30% protein, is GMO-Free with an Earthy flavor that doesn't mix terribly well with liquids and is grainy. Flax protein has up to 20% protein, is GMO-Free with a Nutty flavor that doesn't mix terribly well with liquids and is grainy. You can see that there are 3 “stars” in that list that have nicely high protein levels, are GMO-free and are reasonably compatible in a shake powder mix, and those three are Pea, Brown Rice and Hemp proteins which make the perfect Plant-Based Protein SuperBlend. Pea: highly digestible and with a fluffy texture, it is high in glutamic acid, which helps convert carbs into energy so they won’t be stored as fat. Brown Rice: hypo-allergic and easily digested, perfect for anyone with a sensitive stomach or allergies to soy or dairy. Hemp: a near-complete plant-based protein, hemp offers the inflammation-fighting power of omega-6 essential fatty acids and is high in fiber. No single plant-based protein offers the complete spectrum of protein, so it is best to combine the 3 optimum plant proteins, Pea, Brown Rice and Hemp for full amino acid profile, and for a full range of nutrition be sure your supplement adds enzymes, probiotics, natural greens, high ORAC antioxidants, and plenty of Superfoods. L-Glutamine: Breaks down protein to amino acids causing anabolic muscle growth, as well as enhancing brain functions (learning and memory). Chlorella (algae): One of the major components in detoxification, Chlorella also is high in essential nutrients and aids in healthy bacteria in the GI tract. Chlorella's cleansing action on the bowel and other elimination channels, as well as its protection of the liver, helps keep the blood clean. It is alkaline and helps balance your body's pH. Spirulina: Aids with cholesterol, acts as an antioxidant, strengthens cell membrane, and is a powerful immune builder. Spirulina contains 12 vitamins, 11 minerals, 4 important pigments, 8 essential fatty acids, 6 non-essential fatty acids, 8 amino acids and 10 non-essential acids, besides chlorophyll, phycocyanin, linolenic acids and gamma linolenic acid. *Carrot Powder Certified Organic: An excellent source of Vitamin A, it also helps remove toxins and helps with vision. *Broccoli Powder Certified Organic: (fiber) Aids with cholesterol, is an anti-inflammatory and helps to boost immunity while providing an excellent fiber source. *Cauliflower Powder Certified Organic: Counteracts excess estrogen and may help prevent certain types of cancer. *Spinach Powder Certified Organic: An anti-inflammatory, it also boosts energy brain function, aids the immune system and helps raise hemoglobin in blood. *Parsley Powder Certified Organic: Helps regulate blood sugar, helps digestive tract disorders and cleanses the body of toxins. *Kale Powder Certified Organic: An antioxidant and anti-inflammatory that is also high in Vitamin A.
Acerola Berry Juice Powder: An antioxidant with a high Vitamin C ( ORAC ) level. Flax Seed Powder: (fiber) Helps to lower cholesterol, helps the immune system and promotes better blood circulation. Apple Fiber Pectin: (fiber) Helps remove cholesterol by binding to it while cleansing the intestinal tract. Brown Rice Bran: Contains phytosterols, is high in nutrients and boosts CoQ10. Milk Thistle Seed Ext. 80 % Silymarin: An antioxidant for the liver, it lowers liver enzyme levels. Red Beet Root Powder: Cleansing agent for the GI tract that is low in fat and high in minerals. Bromelain: This enzyme breaks down proteins, acts as an anti-inflammatory agent, and is highly beneficial for use with digestive problems and phlebitis. Papain: This enzyme breaks down protein and aids in digesting nutrients. Protease: This enzyme breaks down protein into amino acids. Amylase: This enzyme breaks down starches (carbohydrates) into simple sugars. Lipase: This enzyme breaks down fat into simpler forms. Cellulase: This enzyme breaks down plant fiber or cell membranes. Lactase: This enzyme is essential for digestive hydrolysis of lactose in milk. Lactobacillus Acidophilus (dairy free): This helps restore good balance of bacteria in intestinal tract and helps the immune system. Bifido Bacterium Longum (dairy free): Helps manage lactose intolerance, aids in lowering cholesterol and helps both the immune system and digestion. Lactobacillus Casei (dairy free): Aids in lowering cholesterol and helps both the immune system and digestion. Lactobaccillus Rhamnosus (dairy free): This inhibits the growth of most harmful bacteria in the intestine, while also aiding in lowering cholesterol and helping both the immune system and digestion. It also lowers blood pressure and increases mineral absorption. Green tea Ext ( 60% Polyphenols) Decaffeinated: An antioxidant and antibacterial, it helps to lower cholesterol and blood pressure, while clinical studies have also shown it to aid in weight loss. Quercetin 98% Dihydrate (flavonoid): An anti-inflammatory and antioxidant that also helps blood pressure. Polygonum Cuspidatum: A concentrated form of resveratrol, with anti-cancer, anti-inflammatory, blood-sugar-lowering and other beneficial cardiovascular effects. Concord Grape: An antioxidant with resveratrol, with anti-cancer, anti-inflammatory, blood-sugar-lowering and other beneficial cardiovascular effects. *Cinnamon Powder Organic: An antibacterial and antifungal that aids with gastrointestinal problems. Aloe Leaf Powder: Helps cholesterol, is an anti-inflammatory, it helps heal wounds and helps to clean the colon. Turmeric Rhizome: An anti-inflammatory, antiseptic and antibacterial, it helps the digestive tract, improves blood circulation and stimulates the immune system. Maitake Mushroom Powder: Aids the immune system, is an antioxidant and helps lower blood pressure. Shitake Mushroom Powder: May help protect against bacterial and viral illnesses. Cordyceps (fungi): Helps to lower cholesterol, builds the immune system, enhances energy levels, and benefits blood circulation, the respiratory system and proper male hormone levels. Bee Pollen: Is an anti-inflammatory, helps the immune system, improves both stamina and energy while helping also with anxiety and depression. Bee Propolis: An anti-inflammatory that has many beneficial effects on viral diseases, ulcers , superficial burns or scalds. allergies, and promotes heart health while strengthening the immune system and reducing the chances of cataracts. 10-HDA Royal Jelly: Helps the immune system, improves both stamina and energy while helping also with anxiety and depression. Atlantic Kelp Powder: Rich in Iodine, vital nutrients, amino acids, vitamins and minerals it also aids in digestion and respiration. Dulse (seaweed): An excellent source of minerals and vitamins compared with other vegetables and it contains all trace elements needed by humans and has a high protein content. Pure Brown Seaweed Extract: Helps burn fatty tissue, aids in blood cleansing and intestinal strength, while benefiting the skin, hair, reproductive organs and menstrual regularity. Siberian Ginseng: Helps the immune system, improves energy, stamina, memory and concentration, while also detoxing the liver. ALA Alpha-Lipoic Acid: An antioxidant, it helps improve memory performance and cellular uptake of glucose. MSM: An anti-inflammatory, it maintains joint & cartilage flexibility and elasticity. Lycopene: An antioxidant, it may help reduce the risk of prostate cancer and prostate related symptoms. Co-Enzyme Q10: Vital enzyme for cardiovascular health. This product DOES NOT contain any Soy, Non GMO Soy, Caffeine, artificial coloring or flavoring. Due to the high quality of PH50 Protein Greens, the product will settle during shipping. Administration (FDA). This product is not intended to diagnose, treat, cure or prevent any disease. It Is The Perfect All Natural Low Calorie, Fat Free, Meal Replacement Drink!! Time For A Smoothie? Here We Go!! So, There You Have It!!! Enjoy! !